This campaign gets the stamp of brilliance from Adrants. For a North Carolina, high-end fitness club, McKinney created a series of posters showing balloons bulging out of clothing along with a pin that says "Deflate." Commenting on the campaign, a McKinney creative said, "We thought people would steal the tacks but a little hot glue and some heavy duty gatorboard took care of that problem. Now people just steal the whole poster." 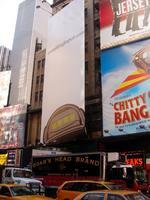 Advertising that gets noticed - a very good thing. 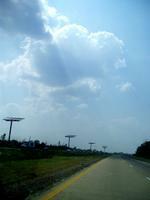 See the campaign here. Large scale, hand-painted outdoor mural company Colossal Media, has undertaken a new project for We Clothing, a Swedish based clothing company entering the US market, painting a billboard advertisement at Colossal's Broadway/Houston location featuring We Activist and celebrity Jason Lee. 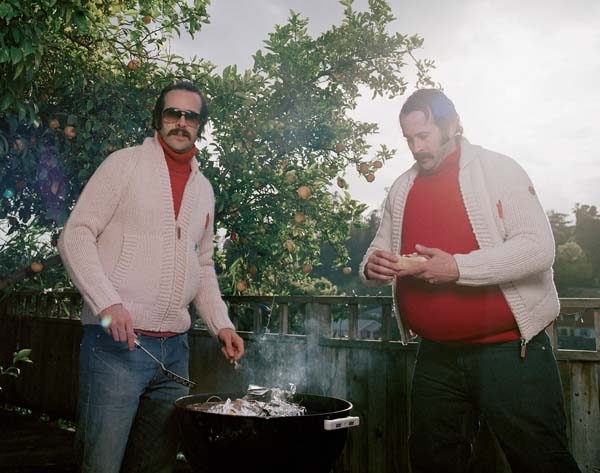 The ad features Lee, star of the NBC sitcom My Name is Earl and his "twin," an overweight version of Lee, eating the hamburgers that the skinny Lee "twin" is cooking on a grill. The We Clothing store is opening nearby, on Lafayette Street in New York City's SoHo shopping district in late November. Colossal started painting this We Clothing project at the beginning of October. Adrants reader Charley Brough tells us an interesting billboard campaign has just been launched in Seattle, Los Angeles and Minneapolis by the Alaska Travel Industry Association which consists of a board that looks like an Alaskan license plate and says "Alaska B4UDIE." It's definite a a different approach to touorism marketing. We like it. Hurricane Katrina, without doubt, ravaged New Orleans and didn't leave much good behind except, as some Flickr users appreciate, the eradication of outdoors boards which previously lined area roadways. Former forehead guy and trend-a-holic Andrew Fischer who sold his forehead as ad space for $37,375 and spawned endless copy-cat efforts is now latching on to the recent million dollar home page trendlet but is taking it further. Fischer plans to award a million dollars over the course of one year and to raise the money, he is selling :30 ad space on a Times Square Manhattan billboard for as little as $10 per spot. There will be 2,880 available :30's per day. Fischer plans to award $2,000 per day to the person who find the hidden sponsor of the day. It's not clear how that will work but a $100,000 grand prize will be awarded as well at the end of the year. The promotion is set to launch January 2006. Expect to see Golden Palace very soon. UPDATE: We are informed this promotion has been put on hold indefinitely. When you launch a business that depends on consumer contributed content, you'd better hope consumers contribute. Al Gore's Current TV is on the hunt for content and is doing so with a robot character called ViC and a big Times Square billboard that says AwaitingInput.com. Not much to say about this other than it's a pretty cool choice of ad medium. 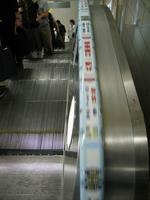 There's not much to do while riding an escalator so you might as well look at ads on the handrail. We've seen this image of a billboard at Mission and Duboce in San Fransisco floating around for w few days so we figured we' share it. 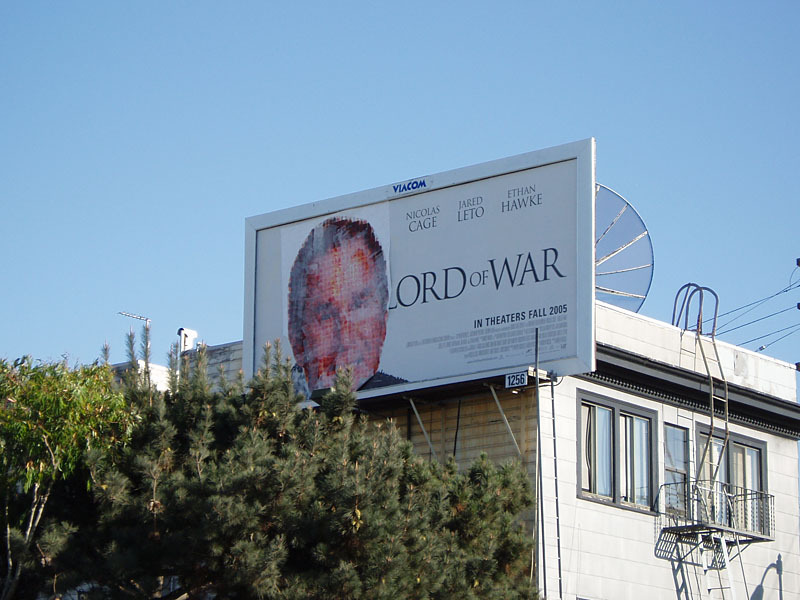 It's a billboard for the Nicholas Cage movie Lord of Ward bur the image has been covered over with a picture of President Bush yielding a cute, little political statement for us all to laugh at. 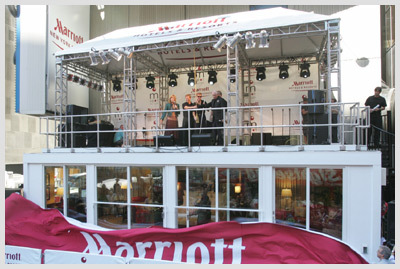 Hotel Chatter tells us Marriott Hotels has unveiled mSpot, a combined live billboard/musical concert billboard, in New York's Times Square. The board promotes what the hotel chain calls its "hip new room design" and will feature appearances by musical acts Ciara, Marc Broussard, Antigone Rising and Collective Soul along with a wedding held behind a glassed in section of the board. The "board" will be in place for four days.